At its hardware launch event in San Francisco today, Google officially announced its new Pixel and Pixel XL Android Nougat-based flagship phone. The handsets, which are being assembled by HTC feature unibody cases made of aluminum, with decorative glass panels on the rear. These are the first phones with Google Assistant built in and ready for the company’s Daydream VR platform. The Pixel is a 5-inch device with a Full HD AMOLED display that’s protected by Gorilla Glass 4. It’s powered by a Snapdragon 821 2.15GHz processor paired with 4GB RAM, with your choice of 32GB or 128GB of space. It has a 12-megapixel rear camera with an f/2.0 aperture above the fingerprint sensor; on the front is an 8-megapixel snapper for selfies and video calls. The phone packs a 2,770mAh battery which Google says will offer up to 7 hours of use with just 15 minutes of charging. The Pixel XL shares most of these components, but features a larger body with a 5.5-inch Quad HD display and a bigger 3,450mAh battery. In the on-stage demo, Assistant was shown performing a number of tasks by responding to natural language queries entered in text or with your voice, like playing music, fetching information from the Web and sending a text. Assistant also surfaces contextual information based on whatever’s displayed on your screen, when you long-press the home button (basically the same way Google Now on Tap works). It also lets you carry on with your tasks, like booking a table at a restaurant. 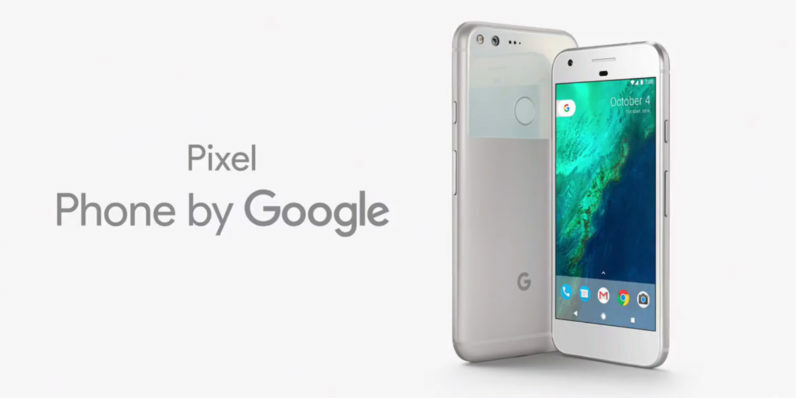 The Pixel features a 12.3-megapixel rear camera with an f/2.0 aperture and a large 1.55 micron pixels sensor. It offers functionality like Smart Burst, which lets you take a series of photos and automatically find the sharpest one, as well as HDR Plus, which allows for increased image quality and reduced blurriness. In terms of performance, Google Pixel beats the iPhone 7, according to DxOMark’s camera benchmarking program that gave the device a score of 89. Google is confident that its camera app is fast enough to process images twice as quickly as previous technologies, so HDR Plus is turned on by default. The company also boasts zero shutter lag on the Pixel. In addition, the camera offers built-in video stabilization for less janky clips. Google is offering Pixel users free unlimited storage for all their photos and videos shot on the device at full resolution, including 4K video. The new phones also offer more cool features like automatic updates which download in the background and install themselves, so you get to use the latest build the next time you restart your device. Pixel users will also be able to take advantage of 24/7 live customer care via phone and chat, along with a screen sharing option so it’s easier for reps to diagnose your device’s issues. The handsets will also be compatible with Live Cases that feature new artworks from curated photographers and artists. You’ll be able to choose from three colors: Quite Black, Really Blue and Very Silver. Google Pixel will be available at a starting price of $649 or $27 per month from Verizon in the US, as well as from the Google Store and numerous retail partners and carriers across the globe. It’ll also arrive on Google’s Project Fi network. You can pre-order it now in the US, Australia, Canada, the UK and Germany; customers in India can order it on October 13. Follow our full coverage of Google’s hardware launch event here. Join us on Facebook Live after the event as we discuss all the breaking Google product news.